Singapore, 9 November 2016 – Epson, a world leader in digital imaging and printing solutions, has launched the L380, L385 and L485 Multi-Function Printers, that will complement Epson’s current range of ink tank printers to provide added value for consumers. These new L-series printers continues to provide one of the lowest printing costs in the market with extremely high page yield, enabling home offices and small businesses to save on their running costs. The L380, L385 and L485 ink tank printers bring superior performance and reliable quality, at improved printing speeds of 10 ipm for black and white, and 5 ipm in colour, bringing increased productivity. The 3 models offer ultra-high page yields of 7,500 pages in colour or 4,500 pages in black with each set of inks, delivering one of the lowest costs per print in the market. 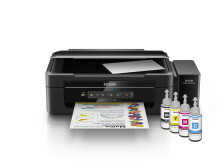 The compact L385 and L485 printers come with wireless connectivity, with the L485 bringing added convenience with Wi-Fi Direct, enabling connection with up to 4 devices without a router. The printers come with Epson’s suite of connectivity features enabling printing and scanning directly to the user’s smart device or from online cloud storage services. For scanning capabilities, the L380 scans at 600 x1200dpi, and the L385 and L485 scans at 1200 x 2400dpi. 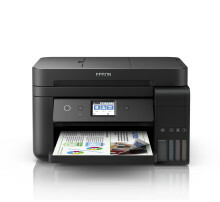 The L380 comes with a 2 year warranty or 50,000 prints, and the L385 & L485 comes with 2 year or 30,000 prints. The L380 printer provides more value with an additional 2 black bottles on top of the provided set of bottles. “The refreshed line up of L-series printers has improved speeds to help businesses improve productivity and save on running costs. We are proud to highlight that Epson’s L-series range of printers has sold more than 15 million units worldwide. We are continually looking to improve our ink tank system printers, to support the needs of home offices and small businesses,” said Ms Tan May Lin, Epson Singapore’s General Manager (Sales, Marketing & Customer Service Division).